The landscape of genitourinary (GU) malignancies is rapidly evolving, with promising immunotherapy breakthroughs in renal cell carcinoma (RCC) and urothelial carcinoma. The phase III randomized CheckMate-214 trial, for example, compared frontline treatment with the combination of nivolumab (Opdivo) and ipilimumab (Yervoy) versus sunitinib (Sutent) in patients with metastatic RCC. The combination reduced the risk of death by 32%, and the median overall survival (OS) was not reached with the combination versus 32.9 months with sunitinib (HR, 0.68; 99.8% CI, 0.49-0.95; P = .0003). Among patients with intermediate- and poor-risk disease the risk reduction was 37%. 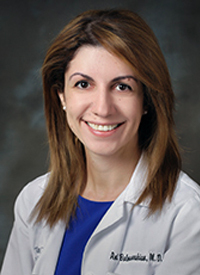 Ani S. Balmanoukian, MD, director of Thoracic Oncology, and associate director of the Phase I Immune-Oncology Program at The Angeles Clinic and Research Institute, discussed GU immunotherapy developments in a presentation during the 2018 OncLive® State of the Science Summit™ on Genitourinary Cancers. In an interview during the meeting, she highlighted the focal points of her presentation. OncLive: Please give an overview of your lecture on advances with immunotherapy in GU cancers. Balmanoukian: The field has come a long way since the initial introduction of checkpoint inhibitors a few years ago. There have been significant advancements in checkpoint inhibitors in the last 2 years in both RCC and urothelial carcinoma. At the 3-year mark, we are seeing significant differences and improvements in median OS with nivolumab versus everolimus in RCC. Beyond that, combinations with immune checkpoint inhibitors seem to be carving out a place in the treatment of various malignancies in GU cancers, including RCC. The CheckMate-214 trial showed promising results in the newly diagnosed setting, with the combination of ipilimumab and nivolumab versus sunitinib. The combination of checkpoint inhibitors showed significant improvements in median OS for patients with RCC with intermediate- and poor-risk disease versus sunitinib. We are also seeing interesting new combinations with immunotherapy, including IDO inhibitors plus pembrolizumab (Keytruda), and IDO plus other checkpoint inhibitors. These combinations are showing promising activity in both RCC and urothelial carcinoma. In RCC, there are some interesting results combining VEGF tyrosine kinase inhibitors with immunotherapy. Those are predominantly early-phase trials, but we are seeing some nice responses using those combinations, and more advanced trials are forthcoming. We will see if those combinations pan out as options for patients in the future.